Thank you for choosing Juicey Lucy's for your cleanse! We are proud to bring our 18 years of experience to serve you. As thousands of Bay Area residents have found, a Juicey Lucy's cleanse will renew your vitality and help you create a healthy relationship with food. To get started, choose either a Juice Only or a Juice and Food cleanse below, and find out what keeps our devoted clients coming back again and again. Refresh your body whenever you feel tired or sluggish, when you're feeling irritable, foggy or have difficulty concentrating. A Juicey Lucy's cleanse will help you whenever you are feeling less than your best, by hydrating your cells and supercharging your system with living enzymes. Whether you cleanse once a week or once a month, a Juicey Lucy's cleanse is the perfect choice to nourish your body from the inside out. 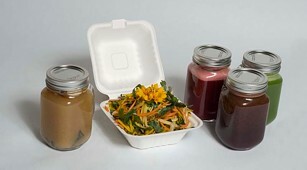 Revitalize your body by enjoying home delivery of freshly juiced 100% organic fruits and vegetables. Our expert staff presses each juice individually just for you, and it is rushed straight to your door. 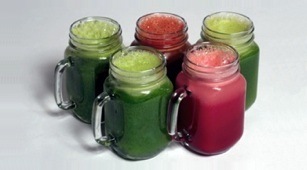 Our juices are special, and will hydrate and nourish your whole body, resulting in greater overall vitality. Juicey Lucy's is proud to provide you with juices made from local, seasonal, organic produce, and places our vast knowledge and experience at your service. The stress of everyday life in the city can deplete your body of it's natural vitality. A Juicey Lucy's cleanse will replenish vitamins and minerals sapped by environmental toxins and eating-on-the-run lifestyles. Give back to your body by feeding it hydrating, nourishing juice blends that will result in feeling and looking your best. Enjoy clear thinking, regular digestion, a radiant complexion, and the joy of knowing that you've made a great choice of which you can be proud. Juice only or Juice & Food?